As I was incensing the altar at the beginning of Mass, I was reminded of a time last year when I was saying Mass for the nuns at Our Lady of the Angels Monastery in Hanceville, Alabama, where Mother Angelica and the Poor Clare's have a monastery. The altar boy put too many coals in the thurible so that I could not close the lid of the thurible and when I began swinging the incense, shards of burning coals began to fly out over the altar linens and the sanctuary. Keep in mind that the entire sanctuary is made of marble and so 3 extern nuns rushed into the sanctuary with cloths to clean up my mess and with each swing of the thurible, I kept thinking, "This is probably the last time I say Mass here." After the Mass, I was joking with the nuns that they probably have a wall full of pictures of priests who are not allowed to offer Mass at the monastery. They were stone-faced. Maybe they do have that list. . . In the Basilica of St. Paul Outside the Walls in Rome, there is a wonderful painting that hangs in the right transept,. depicting the subject of today's solemnity. 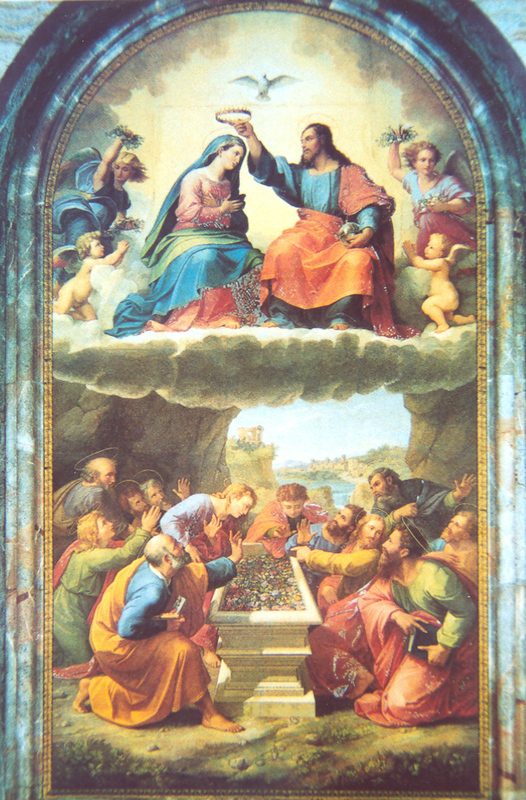 The painting shows the Apostles gathered around the tomb of Mary. As they look down into the tomb, they find only flowers in there and no corpse. Some of the Apostles gaze heavenward, where Mary is depicted in the heavens, receiving her crown as Queen of Heaven and Earth. The painting combines both artistry and faith content all in the same moment. The Dogma of the Assumption is the most ancient feastday of Our Lady - it has been celebrated by the East since before the year of 500. In the West, St. Gregory of Tours wrote about the Assumption as early as the 6th century. It is one of the most unique dogmas defined by the Church because practically every other dogma of the Church had been defined in response to a doubt or an attack on an element of the Faith. For example, the Apostles Creed, formulated at the Council of Jerusalem in 53 AD was written in response to doubts about the person of Christ. In the 300's the Nicene-Constantinople Creed which we recite each Sunday and Solemnity, further defended both the divinity and the humanity of Jesus. This is also a pre-feminist solemnity. As Catholics, we believe that it is not only the God-man, Jesus Christ, who is in heaven, body and soul but that a woman is as well - Mary. We are the only Christians who believe that both a man and a woman already enjoy the glorified state. Protestants hold that only Christ is in His glorified state, not Mary. Isn't it striking that for as much as the Church is called anti-woman, we are the only Christians who believe a woman is already in her glorified state. As I mentioned earlier, today we celebrate the fact that Mary enjoys now in her body and soul what we anticipate at the end of time. When the rest of us die, our bodies remain here on the earth (usually buried somewhere) and our souls face particular judgment. It will only be at the resurrection of the dead that our souls and bodies will be reunited in their glorified state. Purgatory will cease to exist at the final judgment and only heaven and hell will remain. I find it fascinating that in a Church like ours that has as deep a tradition venerating relics as we do, there has never, ever been a tradition or claim on possession of the relics of Mary. That's because there aren't any. Her tomb in Ephesus, which is in modern-day Turkey, is empty. So, what happened to Mary? Did she die? Or, as the East holds, did she merely fall asleep? The East celebrates this Solemnity as the Dormition (or the falling asleep) of Mary, not the Assumption. Is any of this in Scripture? Not literally. The closest reference we have to it is found in St. John's Book of Revelation when he describes a woman clothed with the Sun with the moon at her feet and wearing a crown of stars. In the Old Testament, two figures, Elijah and Enoch were taken into the next life without dying. In spite of a lack of direct Scriptural, keep in mind that the Gospels aren't about Mary - they're about Jesus. This is a perfect example of how we Catholics see the Scriptures as emanating from our Tradition, not vice-versa. Most Protestants reject belief in the Assumption because it seems to lack a Scriptural "proof text." Most Protestants hold that the Bible alone is to determine what Christians should believe. For Catholics, it is not so. For us, we hold that doctrines don't need to be in Scripture in order to be found to be true because Scripture itself does not teach that it itself is the source of all doctrine. Besides, the Tradition of the Church pre-dates the composition of the Scriptures as we now know them, so it is obviously legitimate and logical to conclude that the Church relied on Tradition long before it relied on Scripture in order to develop doctrine, including that of the Assumption. Finally, we do well to take pause of what a terrifically pro-life Gospel scene we have today - the timeless depiction of the 2nd Joyful Mystery - Visitation. In this scene, taken from the Gospel of St. Luke, we find the hope of humanity in all of its simplicity and humility. We are presented with Mary, the Virgin-Mother of the Savior, who arrives at the home of Elizabeth, pregnant with John the Baptist, who leaps in her womb. Leaps in her womb - which indicates, that the infant had God-awareness while still in the womb! Phenomenal! What an incredible scene - two cousins, pregnant with the future, the hope and the salvation of the human race.